Historically, outdoor furniture has not been well documented. Because it was often viewed as having a short life due to its exposure to the elements—sun, wind, rain, and snow—homeowners often replaced it every few years. Indoor furniture that is built to last has traditionally has garnered more attention and praise. Through the years, labels and marques of patio furniture have fallen off. And thanks to the web and a plethora of "experts," misidentification of furniture manufacturers and lines runs rampant. In spite of the seasonal nature of outdoor furniture, a funny thing has happened along the way. Against the odds, many of these outdoor pieces held up through the years, and collectors began taking notice of certain manufacturers, lines or styles that they found especially appealing. Some survivors might have survived because the original owners often took better care of their possessions—that "pride of ownership" philosophy that may have been handed down from their ancestors. Remaining patio sets might have been stored in basements or sheds during the off season, and cleaned regularly or protected by overhead roofs or shade. Others might have been used indoors. During the post-World War II housing boom, the John B. Salterini NEVA-RUST furniture company marketed its garden furniture in home and garden magazine ads, touting, "It's the decorative trend, using wrought iron furniture indoors because it brings into your home the freshness and gaiety of a flowery summer garden." Salterini also made a push for indoor use in magazine advertisements featuring illustrations of lean, long-legged homemakers in high heels and aprons serving dinner on their patio dining tables, with ad copy suggesting the furniture was perfect for budget-minded "young marrieds." Recommending that homeowners use the garden furniture indoors helped justify the higher price tags on these sets, which were sold at "finer furniture stores" and through interior decorators. West Coast-based companies like O.W. 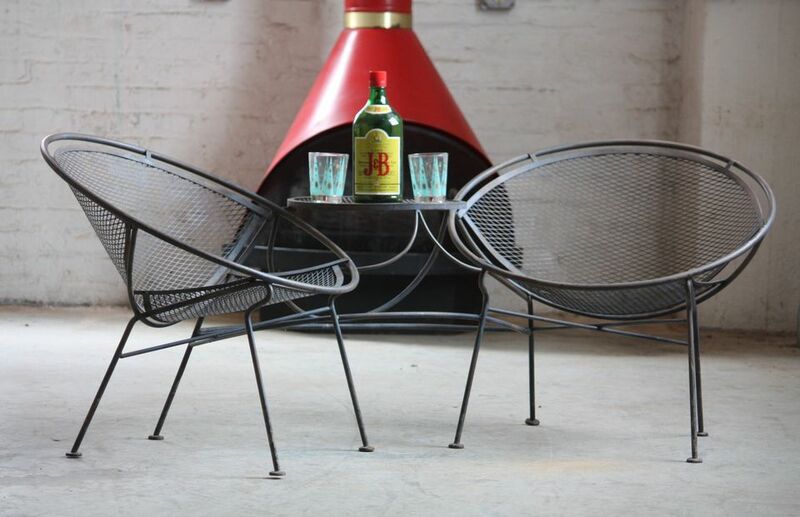 Lee and Brown Jordan focused on producing outdoor furniture that could be used year-round in climates that enjoyed the burgeoning patio culture, like California, Arizona, and Florida. "The midcentury years in Los Angeles were a period of extraordinary creativity, nurturing designers and architects like Charles Eames, Richard Neutra, and John Lautner, while a mild climate allowed people to redefine concepts of architecture and lifestyle," explains Stephen F. Elton, Chief Brand Officer for Brown Jordan. "Entertaining on the patio or lounging by the pool became a way of life. And Brown Jordan became synonymous with outdoor furniture of timeless design and enduring quality." While most of the more collectible lines of outdoor furniture are Midcentury Modern in style, not everything produced during that era was modern. Salterini designed the ultra-modern Clamshell line but also manufactured more traditional pieces like the French Provincial set—same wrought iron material but an entirely different look. Prices vary widely for patio furniture—many sellers don't know what they have since it has not been well documented. Yes, it's possible to score a deal on more high-end pieces through sites like eBay or CraigsList , but don't expect the furniture to be in the pristine condition you might find on auction sites like 1stDibs. However, with research and vigilance, you might find something valuable that you absolutely love. We've researched and compiled a list of the most collectible brands of outdoor furniture, including their more popular lines. Location: Started in Pasadena, California. Bronze collection by Walter Lamb. Introduced in the 1940s and made using cotton cording and copper pipe salvaged from naval ships that had sunk in Pearl Harbor, the Bronze collection was popular through the 1960s and reintroduced in 2008. Founders: Mert Bottemiller and Al Engelemann started Homecrest as an offshoot of a retail furniture shop when they attempted to design a better hassock (ottoman) than their vendors could supply. The business expanded into lines of indoor and outdoor furniture. Known for: Modern designs and Bottemiller's swivel rocker mechanism, which was patented in 1956. Molla began in England in the late 1800s but moved to the East Coast to produce neoclassical cast aluminum and magnesium metal furniture that was saltwater resistant—good for those estates in Newport, Rhode Island, and beach houses on Cape Cod. Midcentury pieces featured Alumaloy frames that were advertised as being resistant to pitting and rusting, which are major issues with metal furniture kept outside. Metal finishes included special names like Pompeian, Old Pewter, Mediterranean Blue, Iridescent Green, Venetian Blue, Venetian Green, and Yellow. Sometimes mistakenly referred to as bamboo, rattan furniture was made by many manufacturers in the mid-1900s, with a big push after World War II. Why? Troops who fought in the Pacific Theater were exposed to the exotic appeal of the South Sea islands and tropics, and wanted to recapture the better part of their wartime experience with furnishings, accessories, clothing, music, and food that reminded them of these far-off destinations. The following is a list of companies that produced rattan furniture during its heyday. Pieces tended to be large and were better indoors or under a covered patio. Collectors favor strands—what look like poles--and the more strands, the better. Past collectors include Bruce Springsteen and Diane Keaton. Founder: Started by retired engineer Burt M. Baker as the Sarasota Redwood Furniture Co. Founders: Lee Woodard began making handcrafted metal furniture in the 1930s. His three sons, Joe, Lyman and Russell, built the company to become a leader in outdoor furnishings.